Rose of Winter is a simple choose-your-own adventure style story—lots of reading, with a couple of moments to choose how Rosemary will respond to a prompt. While the choices don’t make the plot branch too wildly, they still feel like you’re guiding the adventure to a discrete conclusion. 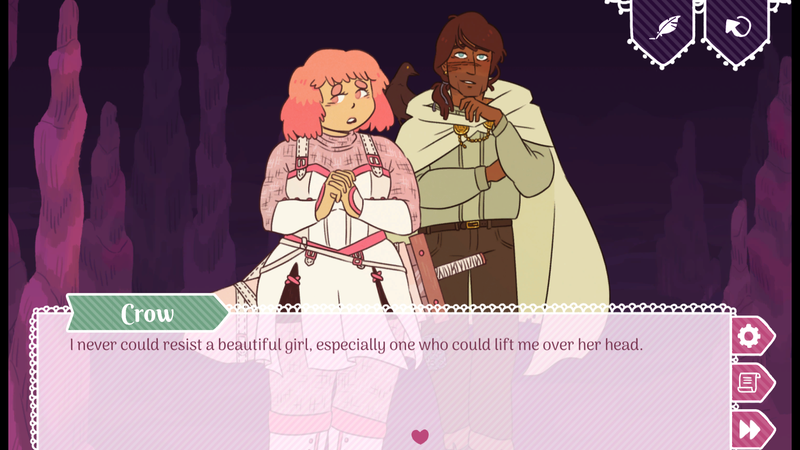 Rose of Winter’s greatest strength is where it departs from visual novel and romance story tropes. While the game’s endings are delineated into “happy” or “sad,” as per the achievements, they’re less extreme than say, Mystic Messenger’s bad ends where you get kidnapped and die. The good endings in Rose of Winter don’t always result in wedding bells and anguished declarations of love, either. The stakes here aren’t centered on external drama, but small moments between you and your chosen prince. In Rose of Winter, first loves are presented as learning experiences. Rosemary and the princes all grow as a result of knowing each other, whether they stay together or not. All the endings, regardless of relationship status, are a little bittersweet. Even after a brief time together both of these people have been changed, and no matter if it’s happy or sad, change can be overwhelming. Rosemary as a character is capable and brave, if a little naive (“Excuse my language, but we’re in a bit of pickle!”). She’s clearly worldly, having chosen at a young age to leave her family’s farm to become a knight, which makes her tenderness with her suitors moving. She isn’t afraid to tell Tirune that she’s not afraid of him, or the arrogant Falkner that he acts like a huge jerk, and she’s not afraid to dive deep into a crush when she’s just met them either. Her innocence is meant to take you back to that exploratory age when crushes devour you, when you’re eager to act on your feelings, and when you don’t yet know what heartbreak feels like. It fits, then, that the paths to each ending isn’t always obvious. As a player you might want to have Rosemary tell the Edward Cullen-esque Prince Tirune that she trusts that he won’t eat her, but is that really what Tirune needs to hear? You might want to believe Prince Kuuya when he says he’s a ferocious warrior, but maybe he’d prefer it if Rosemary took the lead. These choices aren’t esoteric, but they demand that the player pay attention to what these suitors say and how they behave. In short, it’s asking you to fall in love, just as Rosemary is. If you’ve never played a visual novel before, you could do a lot worse than starting with Rose of Winter.